Hermiston senior Hannah Whitsett takes a freethrow during the game with the Madras White Buffalos on Tuesday. HERMISTON - The Hermiston Lady Bulldogs (IMC 7-6) defeated the Madras White Buffalos (IMC 5-8) by the score of 79 to 52 on Tuesday, February 17, 2009. Hermiston led at every break of the game. The Tuesday night game was senior night. Three seniors were acknowledge before the start of the game. Bianca Munoz the Bulldog stat girl, Marie Pedro and Hannah Whitsett. Pedro and Whitsett were members of the 2008 HHS team that, along with Shoni Schimmel, went to the finals of the 5A championship last year. This year they have been hard working starters for the Dawgs. Hermiston's Kathryn Barnitz hit a three pointer to start the first period. Next came a layup by Maloree Moss. Mary Teresa Barnett came in and scored twice giving Hermiston a 9-7 lead following a Madras freethrow that had tied it at seven. Moss scored on a drive to the basket which was followed by a Barnitz shot to give Hermiston the 13-10 lead at the end of the first. Barnitz continued scoring in the second. Other Dawgs scoring in the second included Barnett, Moss and Brooke Davis. Hermiston led at halftime 28 to 23. 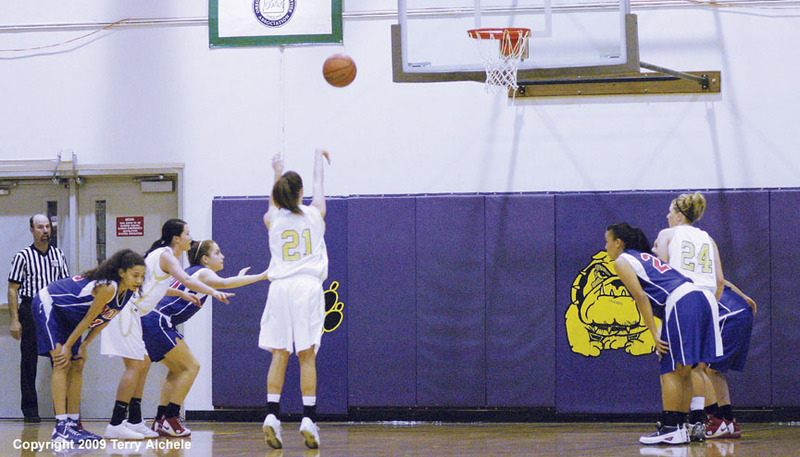 Hermiston senior Marie Pedro started off scoring in the third period with a three pointer. Fellow senior Hannah Whitsett drove nearly the length of the floor for a layup. Whitsett followed up that drive with a trey. Other Dawgs scoring in the third included Moss, Barnitz, Davis, and Jade Crossley. The Dawgs led at the end of the third 50 to 35. It was senior Whitsett that started scoring in the fourth with a three pointer. Other Bulldogs scoring in the fourth were Ashley Place, Moss, Barnett, Whitsett, Pedro, and Barnitz. Hermiston scored 29 points in the fourth to 17 for the Buffalos. Hermiston won 79 to 52. Hermiston remains tied with the Pendleton Bucks and Bend Lava Bears with identical 7-6 records. Hermiston will travel to Pendleton for a Friday night game. First place in the IMC is still Summit at 12-1 and in second place is Crook County. LEFT - Hermiston's Mary Shae Hays takes a shot. 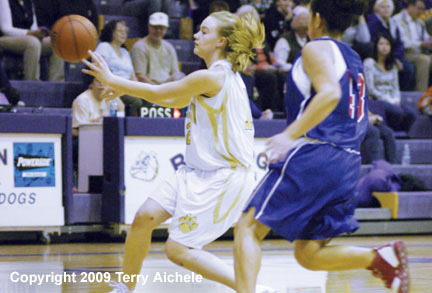 RIGHT - Maloree Moss of the Dawgs passes the ball. LEFT - Hermiston senior Marie Pedro makes her way around Buffalo defender Marissa Ahren. 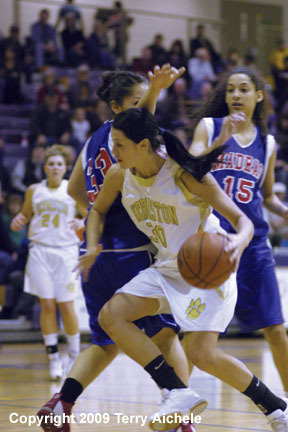 RIGHT - Hermiston junior Mary Shae Hays drives past Cheyenne Wahnetah a Buffalo defender. LEFT - Hermiston senior Hannah Whitsett. 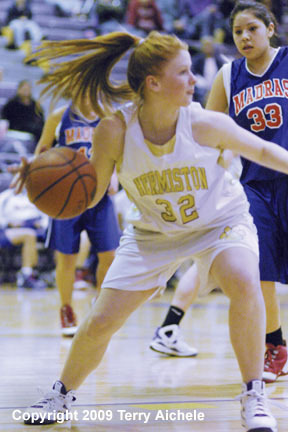 RIGHT - Hermiston's Kathryn Barnitz looks for someone to pass to. 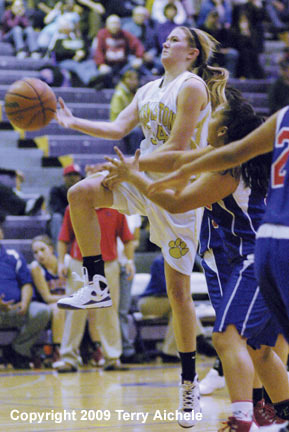 LEFT - Kathryn Barnitz of Hermiston drives to the basket for a layup. 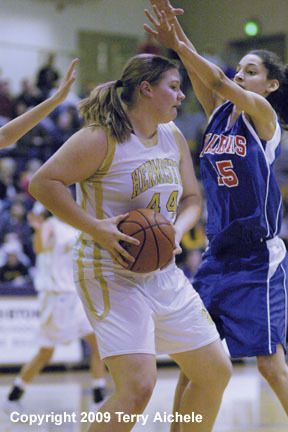 RIGHT - Mary Teresa Barnett of Hermiston grabs a rebound. 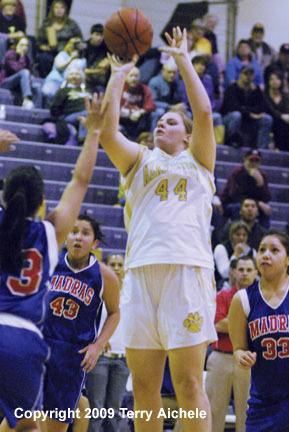 LEFT - Mary Teresa Barnett of Hermiston shoots a jumper. RIGHT - Hermiston senior Hannah Whitsett with the ball. LEFT - Defenders Hannah Whitsett and Brooke Davis of Hermiston pinch down on a White Buffalo player. 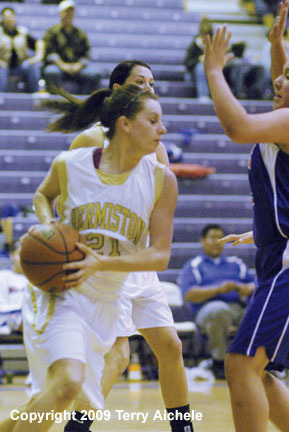 RIGHT - Brooke Davis of Hermiston looks for a teammate to pass to.